At Hitting World, we have the most innovative training equipment for pitchers, including pitching mounds, pitcher gloves, instructional videos and more. Our tools make pitching practice fun and efficient while greatly improving accuracy and technique. We have radar equipment including radar guns, as well as pitching targets for improving throwing technique. These baseball pitching aids give coaches and trainers the resources they need to help turn players into professionals. Our pitching mounds and training equipment for pitchers are perfect for all ages, incorporate the most advanced technology, and are built to withstand frequent use. We only carry the highest quality baseball and softball pitching gear to ensure your team always performs at its best. Order now to enjoy our competitive prices with free shipping on select orders, or give us a call at 877- 300-0087 to speak with one of our experts. The 9 Hole Pitcher's Pocket is an ideal practice screen for evaluating a pitcher's accuracy. The 9 pockets provide a range of targets for a pitcher to improve and evaluate his/her accuracy around the strike zone. The 9 Hole PRO MODEL Pitcher's Pocket is an ideal practice screen for advanced pitchers. The 9 pockets represent the actual size of the strike zone. The Power Drive Pitch-n-Throw Brace strengthens your throwing muscles through resistance while playing catch or doing drills. Throw Like the Pros! The Radar Pitching Trainer combines a pitching target with a sonic radar ball speed indicator and a virtual umpire for the ultimate pitching experience. Keep track of Pitch Count, Strikeouts & Walks – with the trainer’s large “Electronic Umpire” display. FREE SHIPPING! The Ball Coach is the world's only pocket-sized personal speed radar - ushering in a new era in speed radar as its small size, light weight and extremely accurate speed measurements transform the way in which players, coaches, fans and everyday consumers experience the action. FREE SHIPPING! The Pitcher's Power Drive is a pitching mechanics training aid that increases velocity and teaches proper lower body mechanics. It is the choice of top High School, Collegiate and Professional Pitchers ( a Youth Model is now also available). This lower body training aid is to pitchers what the batting tee is to hitters! Teaches proper hip lead, weight transfer & mechanics. Available in Youth and Adult models, in metal or turf. The Softball Power Drive is a pitching & hitting training aid that teaches softball players to maximize their lower body muscles for higher performance. It utilizes an auditory click to increase a pitcher's velocity and increases a hitter's power swing by proper use of the lower body. Choose from 2 Models - Turf or Metal. The Pitcher's Power Stride teaches proper muscle memory for correct pitching mechanics with instant multi-sensory and visual feedback. The Power Drive Performance Sled trains baseball and softball players to initiate their power from the ground up for pitching, hitting, position throwing and fielding. The Sled is a baseball and softball training aid for developing skills and conditioning aid for adding functional strength. Much more durable than your standard L-Screen! This L-Screen is 7'x7' with a 3'x3' cutout. Heavy duty 14 gauge 1 1/2" dia. frame. Powder coated black. Bolt together assembly for strength. Slip on pillow case style net. #60 knotted PE netting. UV weather treated. FREE SHIPPING! The Pro Model 4-Way Pitching Rubber from Champion Sports is a 4-way pitcher's box that can be rotated on each side for extended life and durability. This pitching rubber will last a lifetime. Made of durable, solid white rubber with PVC inner core for support. Official size 24" x 6" x 6". The Pro Step Down Pitching Rubber from Champion Sports is a high quality, official size step down pitcher's rubber. The Anchor Style Pitcher's Plate from Champion Sports is an Adult size pitcher's plate with removable inground anchor system. The Official Size Pitcher's Plate from Champion Sports is an Adult size pitching rubber with 3 stakes for attachment. Large 6x6 pitching target that lets you pitch to an actual batter! Has a canvas batter that extends 28” in front of the main target giving you a realistic workout. It has a dual corner pocket blocker that shrinks the strike zone to two 9”x7” target areas. Work realistic pitch sequences; inside/outside or up/down. FREE SHIPPING! Our top-of-the-line L-screen has a 2" diameter steel tubing frame with a hip protector. Fully padded frame extends net life and reduces ball richochet. Super duty #60 netting slips on pillow-case style for double protection. Includes steel wheels. FREE SHIPPING! The 10", two piece Indoor Practice Pitching Mound from Portolite is a great choice for indoor pitching practice. This is a highly durable and portable mound that will last a long time. The 10", two piece Indoor/Outdoor Practice Pitching Mound from Portolite is your best choice for outdoor pitching practice, but can also be used inside. This is a highly durable and portable astroturf mound that will last a long time. The 6" Game Pitching Mound from Portolite makes a great game mound for multi-use fields. It will feel comfortable to any pitcher 5' tall or taller. The 4" Game Pitching Mound from Portolite is designed for baseball games on multi-use softball fields. It is ideal for 8 - 12 year olds. The Portolite Economy Youth Pitching Mound can change a softball field into a baseball field in just minutes. Weighing less than 30 lbs, it is a great choice for youth league play and practice, or for use at home in the backyard. The 6" Full Game Pitching Mound from Portolite makes a great game mound for multi-use fields. It is recommended for ages 11-14 and pitchers up to 6 feet tall. The ProMounds Training Pitching Mound coverts your field in minutes! Made with high density foam and protected with ProMounds Rubber Armor Technology. Measures 4” H x 36” W x 36” L. Great for Backyard training, Camp and Clinics. Lightweight, Durable, Extremely Portable. The ProMounds Bronco Game Pitching Mound lends itself especially well to portability. Official Little League height specifications. Great for indoor use as well as outdoor use. Measures 6” H x 48” W x 72” L, weighs 50 lbs. Available in Green or Red Clay Artificial Turf. The ProMounds "Minor League" 6" Game Pitching Mound measures 6” H x 60” W x 72” L and weighs 60 lbs. Official Little League height specifications. Great for indoor use as well as outdoor use. Lightweight, durable, and extremely portable. Available in Green or Red Clay Artificial Turf. The ProMounds "Major League" 6" Game Pitching Mound measures 6” H x 60” W x 99” L and weighs 80 lbs. Official Little League height specifications. Great for indoor use as well as outdoor use. Lightweight, durable, and extremely portable. Available in Green or Red Clay Artificial Turf. The ProMounds Professional 10" 2-piece Pitching Mound has custom interlocking system for stability. Measures 10” H x 4’ W x 9’ L and weighs 100 lbs. Used by NCAA Division I Collegiate Athletic Baseball teams. The ProMounds Collegiate Practice Pitching Mound is made out of heavy-duty foam and covered with a rubber armor. This rubber armor is skid proof and will not damage any gym floors. Measures 9’ L x 4’ W x 10” H, weighs 100 lbs. Available in Green or Red Clay Artificial Turf. The ProMounds Pro Model Practice Pitching Mound is made out of heavy-duty foam and covered with a rubber armor. This rubber armor is skid proof and will not damage any gym floors. Measures 9’ L x 5’ W x 10” H, weighs 125 lbs. Available in Green or Red Clay Artificial Turf. The ProMounds Collegiate Pitching Platform has a welded aluminum frame with an inset plywood base. It is covered in spike resistant artificial turf and has wheels for easy transport on and off your field without damaging your grass surface. Telescoping pegs adjust from 6”H to 10”H to accommodate Youth or Adult usage. Measures 7'L x 3'W x 6"H-10"H, weighs 125 lbs. The ProMounds Pro Model Pitching Platform has a reinforced aluminum frame. It is covered in spike resistant artificial turf and has wheels for easy transport on and off your field without damaging your grass surface. Measures 8’L x 4.5’W x 10” H, weighs 155 lbs. The Jennie Finch Softball Powerline Pitching Mat makes a great softball pitching aid. Comes with a regulation pitching rubber attached. Each mat comes with a convenient carrying case and mats have a 2" inlaid white line for more precise training for pitchers of all ages. Choose from two models, Foam back or Non-Skid back. The Jennie Finch Pitching Lane Pro Softball Pitching Mat makes a great softball pitching aid. Measuring 3'x 10', it allows pitchers to lane on a consistent surface, reducing wear on the body. Comes with a regulation pitching rubber attached. The Jennie Finch Pitching Mini-Mat is an ultra portable 3' x 2' turf pitching mat for softball pitching practice. The unique powerline easily aligns with existing gym floor for precise training. Non-skid rubberized backing makes it the perfect softball pitcher's training tool. Portable and easy to store. The True Pitch Regulation Practice Mound is a regulation size mound that is covered in turf for a realistic feel. The True Pitch Bob Feller Bullpen / Backyard Mound has dimensions of 6” high, 4’ wide, and 7’6” long. Portable and lightweight - weighs 80 lbs. The perfect pitching mound for kids ages 6-9. Dimensions are 4” High, 44” wide, and 64” long. Weighs approx. 70 lbs. The True Pitch 202-2 Baseball/Softball Practice Mound is a Training Mound with dimensions of 2” high, 40” wide, and 30” long. Weighs 35 lbs. Built with a durable, light weight memory foam. This mound will hold up to the most demanding schedules for many seasons to come. Built for ages 12 & under. Easy to transport and use on any field. Measures 6"H x 52” x 45”, weighs 35 lbs. The 8" Indoor / Outdoor Game Pitching Mound is a lightweight and durable mound for games or practice. This mound features 80 inches in front of the rubber more than enough room for the strides of your tallest pitchers. The Full Wind Up Indoor/Outdoor Practice Pitching Mound from Portolite is a durable, oversize two-piece practice mound. With the ProMounds Junior Practice Mound, coaches can have another mound at practice and it's affordable enough for parents to purchase for their backyard. Dimensions: 6" x 30" x 76", 42 lbs. The lightest and most durable 8 inch pitching mound on the market just got lighter with the new 2-piece design. The lightest and most durable 10 inch pitching mound on the market just got lighter with the new 2-piece design. The 10" Indoor / Outdoor Game Pitching Mound is a lightweight and durable mound for games or practice. Designated Hitter - The first professional, real-life batting figure that is revolutionizing pitching practice. Pitch inside with confidence, work on pitch location, and throw at game-level intensity in practice without having to worry about injuring a teammate. FREE SHIPPING! Coach Marty Schupak's newest release, "Pitching Drills & Techniques" explores some of the best drills that are beneficial for youth players, ages 7-12 years old, who have the desire to pitch. This video simplifies the pitching process, and includes more than 20 drills which show youth players the importance of the different body parts that make up the perfect pitching motion. A must for any youth baseball coach or parent of aspiring young pitchers. This 12" Pitcher's Glove from D-Bat is made from Premium Select USA steerhide. Features a new innovative web style and traditional open back. Superior coverage of shoulder and upper arm to relieve soreness and swelling. Can be worn over clothing or directly against skin without frostbite or skin burn. Ripstop nylon inner fabric provides rapid cold transfer. Fits either shoulder. Adjustable hook and loop fasteners. Reusable. Safe and non-toxic. 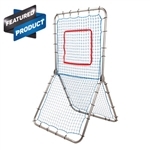 The Multi Sport Net Pitch Back Screen from Champion Sports is a heavy duty rebounder that rotates to different angles for ground balls, line drives and pop flies. 42" x 72", with Powder coated steel frame and heavyweight nylon netting. The next generation Sports Radar! The Stalker Sport 2 is lightweight and highly accurate - to within .1 (one-tenth) of a mile per hour (or km/h). Designed specifically to measure pitching speeds and time base runners. FREE SHIPPING! The Stalker Pro II is our top of the line radar gun, designed especially for our professional baseball customers. It tracks pitcher release speed, plate speed, batted ball speed, or all three speeds. FREE SHIPPING! The all new Pitcher's L-Screen from ATEC features a larger net, better netting and tubing, and added protection in the corner. New and improved with larger size screen, heavier grade netting and 2'' steel tubing (plus 40% heavier wall thickness). New double faced commercial grade HDPE high density polyethylene netting hung on the square. Dimensions: 84" H X 84" W.
The G Tee Pitching Sticks help both pitchers and coaches see where the ball is crossing the plate allowing for a more effective practice! Available in either a short or tall model. FREE SHIPPING! The Pitcher's Tee is a portable, compact pitching aid that helps improve a pitcher's accuracy, consistency, and velocity. ARM STRONG has been strengthening and protecting the arms of players from the youth leagues to the Pros. Many coaches and parents give credit to the ARM STRONG for the increased velocity and good arm health of their players. This is the RevFire Replacement Baseball, for use with the original RevFire Monitor. Official size and weight, yarn wound, premium leather, collegiate balls with black and red stitching. FREE SHIPPING! Packed with unique features, this practice mound will leave a strong presence in your facility or gym. Simply one of the best quality practice mounds available. FREE SHIPPING! A flexible arm brace that allows players to feel proper throwing mechanics.